← How does this work, exactly? 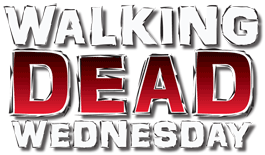 Has anyone seen Walking Dead Wednesday?? It's not in the house! So here's a patented OAFEnet "Fun" "Fact" for you: long before he was inspiring a meme based on the fact that he was always in the wrong place, 7-year-old Chandler Riggs got his first acting role in a movie (or a "movie") called Jesus H. Zombie - that's him sitting on the railroad tracks in the trailer. They're not at all related, it's just a funny coincidence. 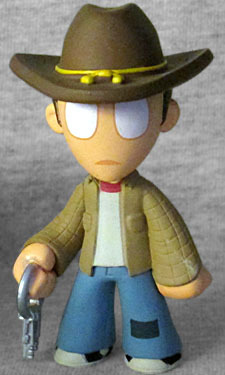 This figure is obviously taken from the survivors' time at the prison, because Carl is carrying a set of jailhouse keys. He's also wearing his dad's hat, though it's a new sculpt - slightly smaller than the one on Rick's head, which makes sense, since Carl's head is also slightly smaller than Rick's. Also, he doesn't have the sheriff's star on there any more, which I didn't realize was accurate to the show until I looked it up. Sadly, he's not wearing his "Coral" outfit - instead, he's wearing his Science Dog T-shirt (minus the logo, but the red collar gives it away) under a long-sleeved plaid shirt. He also appears to be wearing a vest, since the plaid pattern is only sculpted on the arms, but the sleeves and torso are both painted the same tan color. Meanwhile, they bothered to paint the patch on his left knee, because why wouldn't they? Series 2 of the Walking Dead Mystery Minis are not only blind-boxed, they're also sealed in opaque black bags. So when I opened the box and pulled the bag out, all I could feel was the hat - so I thought I was getting a duplicate Rick. Imagine the surprise and relief when I got this little guy instead! This entry was posted in blog exclusive review, fan films, Funko and tagged Mystery Minis, zombies. Bookmark the permalink.